Yay! Another delicious giveaway! Cosmos Creations contacted me recently because their products are gaining steam with the snack subscription boxes, specifically the Love with Food, which caters to the gluten-free crowd. While I don't have celiac and I'm fine with gluten, I love a good snack, so I was happy to give it a try. Cosmos sent me a few bags of their premium popped corn in Salted Caramel and Coconut Crunch flavors. It was hard to choose a favorite, but I think the coconut crunch won by a smidge. It was nice to find a sweet healthy snack that was non-GMO and trans-fat free. I typically crave something sweet in the evening, so this fit the bill. 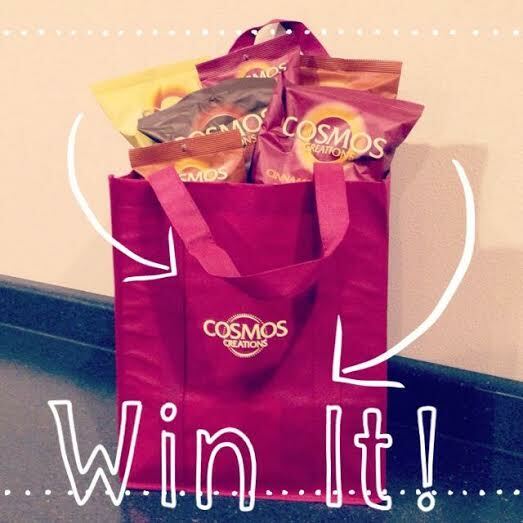 If you'd like to give it a whirl, I've got a giveaway from Cosmos that includes a variety of sweet and savory flavors, as well as some fun swag. I'll use RaffleCopter to select a winner on July 30. Good luck! I saw the story on the news yesterday about the giant popcorn ball they are traveling the country with. I am not gluten-free either, but have come to really enjoy some snacks that are.